Millions of kids all over the world have gone to bed with Goodnight, Goodnight Construction Site since it was first published in April 2011, and has built a huge following of fans. In the eagerly-anticipated follow up, Mighty, Mighty Construction Site, the familiar trucks are joined by a new crew of friends, who work together to get the job done. The book will go on sale February 14, 2017." This book looks just adorable and one the kids would so enjoy. 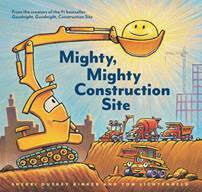 Goodnight, Goodnight, Construction Site is one of my grandsons' favorite book to read. They will love this newest edition!